high price compared to the Arial detergent powders. 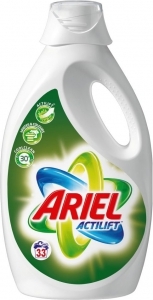 But I used the liquid Arial detergent and I am very much impressed of its usage. It is so because, for one bucket of water only 5 to 6 drops of liquid Arial detergent is enough to clean 10 pairs of clothes. I normally use the liquid Arial detergent for more then 2 months for some times. And even the washing of the clothes is very clean and efficient. of clothes, whether the clothes or delicate ones or even the normal ones. This detergent can also be used with the washing machines. I liked this product a lot becaues it is proven to be the best one for me.